Competition increases as the competitors increase…. Now the Android Market is coming before App Store. The Android Market is giving more free products than App Store but still App Store is touching the heights. 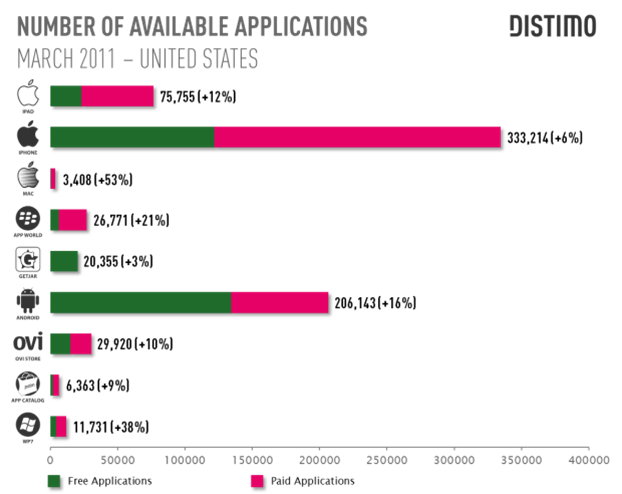 According to a report by Disitmo Android Market provides 134,342 freebies while App Store provides 121,845 freebies. In March 2011 the App Store was declined but the increment reason was the iPhone 4 which lead Apple’s iPhone App Store the most application seller. Okay, the other big name’s are the RIM’s, Nokia & the great Microsoft. These guys are just held back from the start while BlackBerry’s World will be surpassing the OVI Store in the next six months while Windows Phone 7 Marketplace will also overtake the OVI Store means Nokia has to fastly kick out more Symbian^3 devices or else they will be gone…..